The biggest change with CarPlay in iOS 10.3 beta is directly on the Home screen. Three app icons now appear on the status bar. These apps a smaller versions of the primary app icons on the Home screen and stay in view eve when you’re in other apps. This makes it possible to switch between CarPlay apps without pressing the virtual Home button and going back to the Home screen each time. While there are three app icons visible here, it isn’t exactly the last three opened apps that CarPlay picks. Instead, think of each app icon as a category: navigation, communication, and entertainment. Maps will always be included (unless CarPlay opens up to third-party navigation apps. Music, Podcasts, Audiobooks, and third-party audio apps like Overcast and Spotify will take over the second spot depending on what was used most recently. Phone and Messages will use the third spot and potentially VoIP apps like Skype and Facebook Messenger in the future when updated. Communication apps actually behave differently when accessed from the status bar too. For example, tapping the big Messages or Phone icon from the Home screen invokes Siri first, but tapping either icon from the status bar skips Siri and jumps straight to the app’s user interface. OEM apps also take over this third slot when available and used, although our test units both lack examples to include. Prior to iOS 10.3 beta, certain apps would appear in the status bar only when active similar to the same behavior on iPhone. For example, Maps would appear only during navigation, and Phone would appear only during an active phone call. 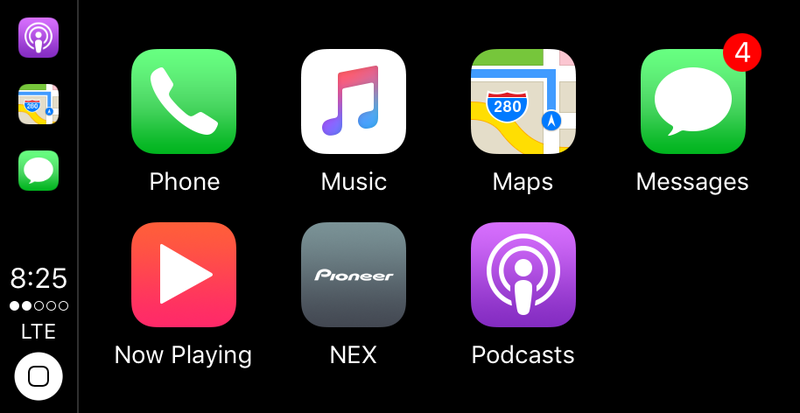 The second major change in CarPlay with iOS 10.3 beta happens in the Music app. Up Next is now available from the Now Playing screen so you can see which songs are coming up in a playlist or album and easily skip around tracks. The Now Playing screen also makes album titles tappable so you can jump straight to a song’s source album without tapping around too many times. This is a major step forward for making something very simple require less interaction. For more on CarPlay, check out our complete guide for the best apps, compatible cars, aftermarket displays, reviews, and more.